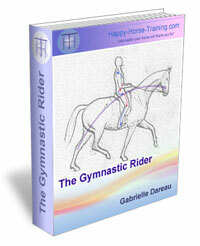 The Happy Horse Cartoon is a humorous look at the lives of horses, seen from their point of view. 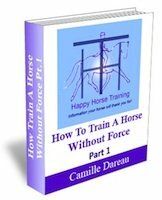 It is also firmly founded in the philosophy of Happy Horse Training. The characters are based on our own horses, personalities we have come to know well over the years, and their real-life relationships within our two bands. We hope it makes you smile! 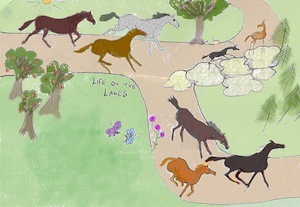 The Happy Horse Cartoon introduces the Happy Horse Herd and their Life on the Lanes. The herd is made up of two bands, Herd Central and The Family. The Happy Herd live close by a local dressage stables, Liberty Lostin Stables, and they often watch the goings on down there. 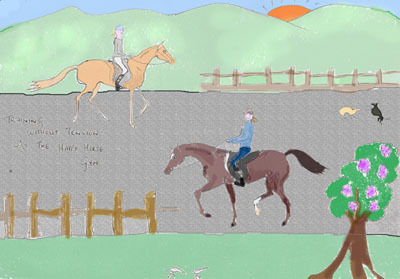 The Happy Horse Cartoon follows the Happy Herd in their various adventures including trips to the Happy Horse Gym (riding arena) and the Happy Horse Alternative Therapy Centre. Queen Meanie: Herd Central Passive Leader: Due to Dummy Foal Syndrome at birth, Meanie is the philosopher and principle maternal figure of this band. 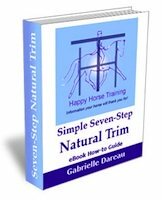 Grinch and Oddie: Grinch is a talented and popular mare, if somewhat grouchy, who hangs around with her slightly scatterbrained ex-racehorse mare friend Oddie. Grandpa: An ageing and opinionated Hanoverian, another passive leader when the mood takes him. Hobgoblin: An anglo arab who is a bit of a loner but still part of the popular bunch on occasion. Fatsa: Chubby Trakhener cross who likes her food and has no fear of adventuring to find more of it. Cra & Jinsy: fancily bred Warmblood foals, now rising yearlings, recently adopted by Herd Central. Raffish Rafi: Ostensible band stallion and the 'Tom Jones' of the Happy Horse Herd despite some overbearing-mare troubles. Bobs (sometimes known as Bobby Blunder by the less charitable) is the dominant mare of The Family. Ermentrude a well meaning but 'artistic' mother figure who has adopted the youngsters of The Family. Totstar and the Cave Troll, Ermentrude's adopted daughter and son. Full brother and sister, a formidable pair with a mixture of Friesian, Merens and predominantly Irish Cob blood lines. Click on a thumbnail below to go to that edition of the cartoon and its accompanying text.